STONE TELLING is a speculative poetry magazine dedicated to showcasing diverse, multi-perspective work of literary quality. Please look at the submission guidelines to see what we're after, and at the About page to find out more information about Stone Telling. You are also invited to visit our blog for news and interviews with poets. Stone Telling is co-edited by Rose Lemberg and Shweta Narayan. Editorial email address is poetry at stonetelling dot com. 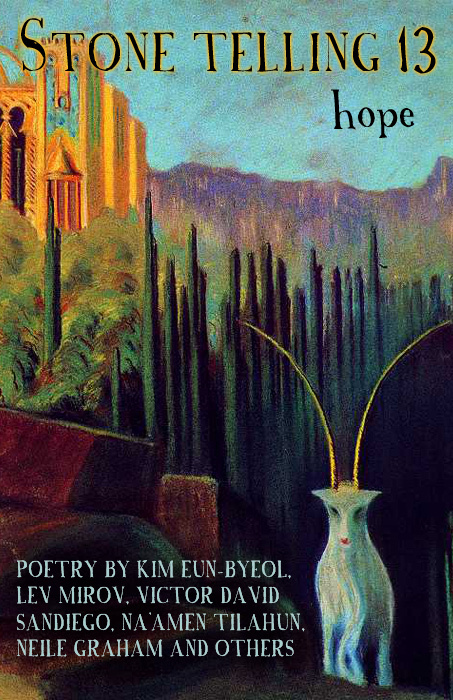 We have a new issue: Stone Telling 13: The Hope Issue. After five years of publishing the magazine, we are going on hiatus in 2016. We hope to be back in 2017. Meanwhile, please enjoy the issue! If you would like to support the magazine, please consider contributing on Patreon to help Stone Telling continue. All your donations go towards purchasing content for the magazine. Book! 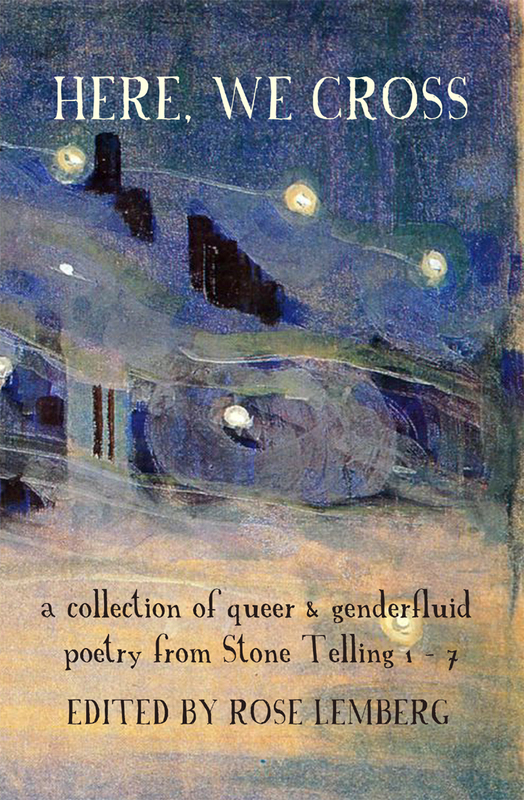 The first collection of Stone Telling poetry, Here, We Cross, which gathers queer and genderfluid poetry from Stone Telling 1-7, is available for purchase from Amazon. (If you are unable to buy from Amazon for any reason, please email us at poetry at stonetelling dot com, and we will gladly send you a copy). All proceedings from the sales support Stone Telling! I find Here, We Cross to be a vital book—thriving and full of life, putting to words intense emotion as well as the internal workings of identity and self. The focus on genderqueer and genderfluid poetry is a particular joy for me as a reader; these are voices still underrepresented in the larger literary conversation, but in this book they are a force, a majority, that must be considered and acknowledged. There’s also a real pleasure to be had in reading a book, cover-to-cover, that is filled with explicitly queer, trans*, neutrois, and asexual voices, all telling pieces of their stories and bringing to vivid life what it means to be them—and therefore, what it means for them to be, what steps must be taken to forge and protect a sense of identity.